Presidential unit Citation, for action 27/08/65 – 28/08/65. Valorous Unit Award, for action 26/06/64. Valorous Unit Award, for action 04/04/65 – 06/04/65. Meritorious Unit Citation, for action 01/07/63 – 30/06/64. Vietnamese Gallantry Cross with Palm, for action 05/05/63 – 30/06/64. Vietnamese Gallantry Cross with Palm, for action 01/03/64 – 26/03/67. Vietnamese Gallantry Cross with Palm, for action 27/03/67 – 18/05/68. Vietnamese Gallantry Cross with Palm, for action 15/1269 – 10/10/70. 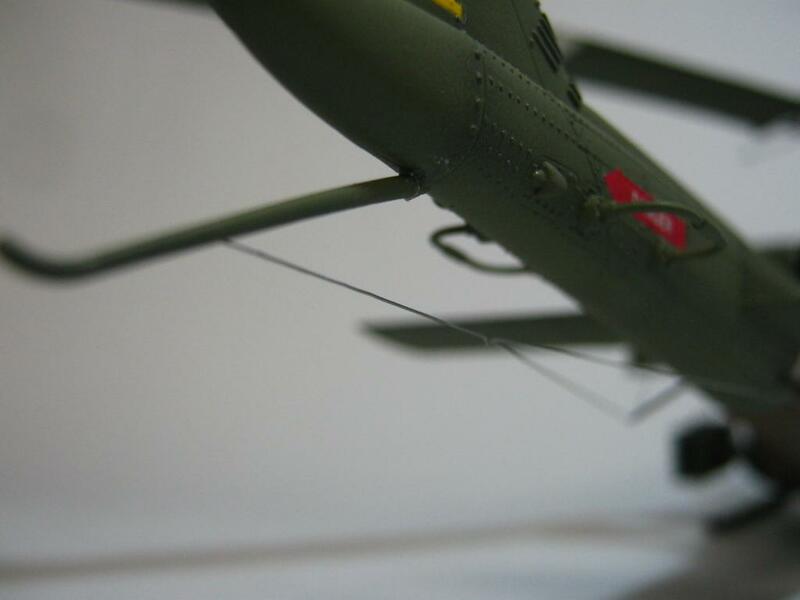 My model depicts ‘Cobra Lead’ as she appeared in action on 18/12/69. 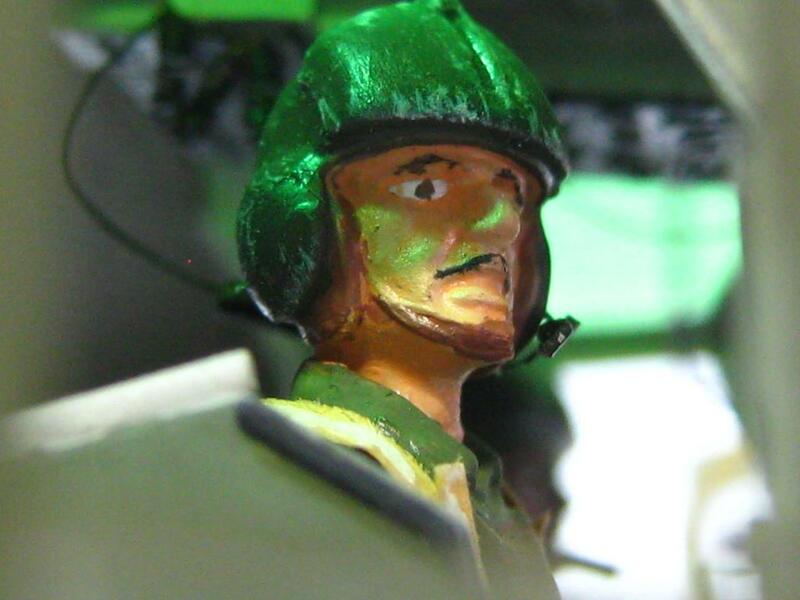 The 114th was a very dedicated and highly motivated outfit and the graffiti that adorned Cobra Lead, for the purpose of morale, attest to that. 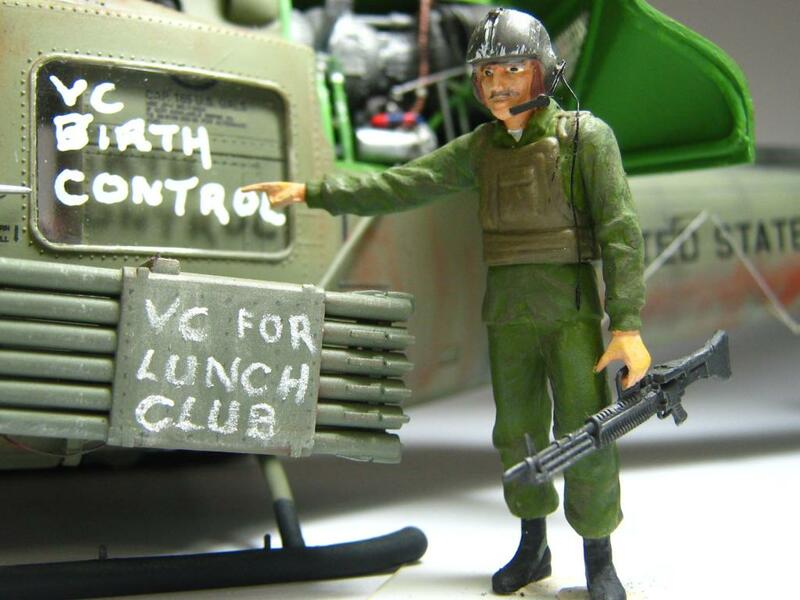 The graffiti “VC for lunch club” and “VC for lunch bunch” seems to have been a favourite since it adorned many of their Huey’s. The graffiti on the plexiglass windows, simulated with a white paint marker, was also common practise at the time. 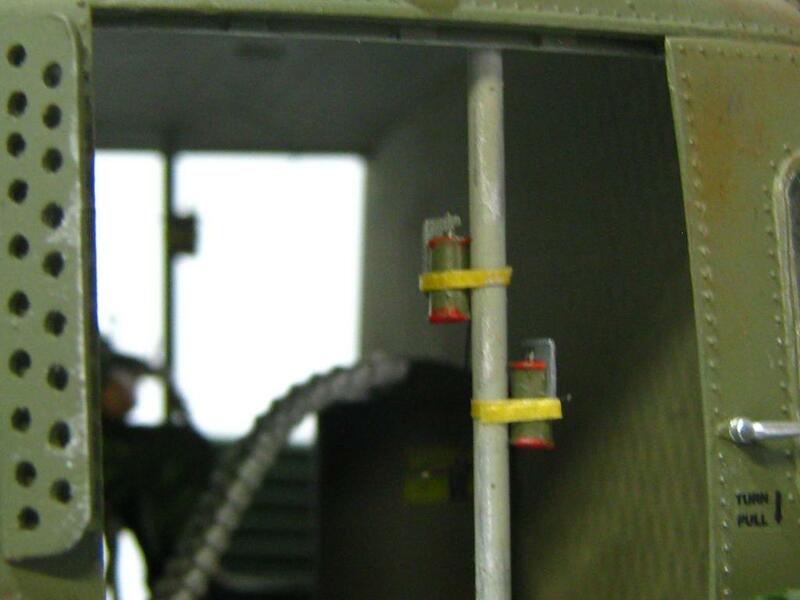 A condom was also placed as a precautionary measure over the barrel of the grenade launcher in the ball turret to protect against debris and dirt entering the barrel. 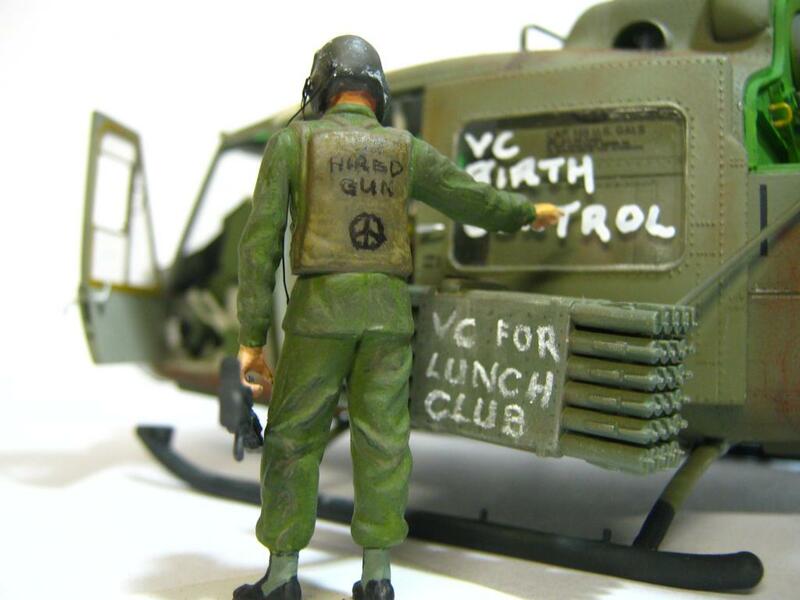 In lieu of this the crew applied the graffiti “VC birth control.” I replicated the condom with Parafilm M.
The FM communications aerial next to the tail rotor assembly was made from copper wire. 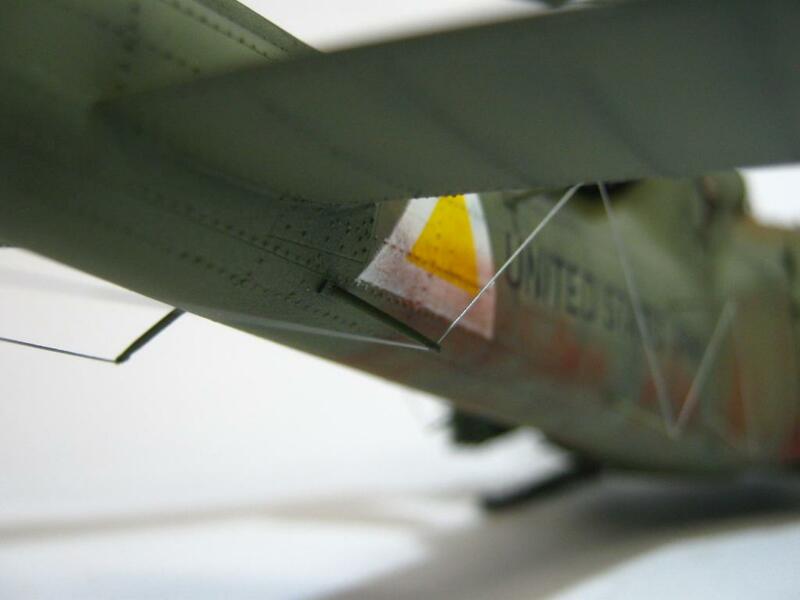 The antenna strung along the tail boom was made from fine fishing line and was glued onto sewing needles and attached to the tail boom. 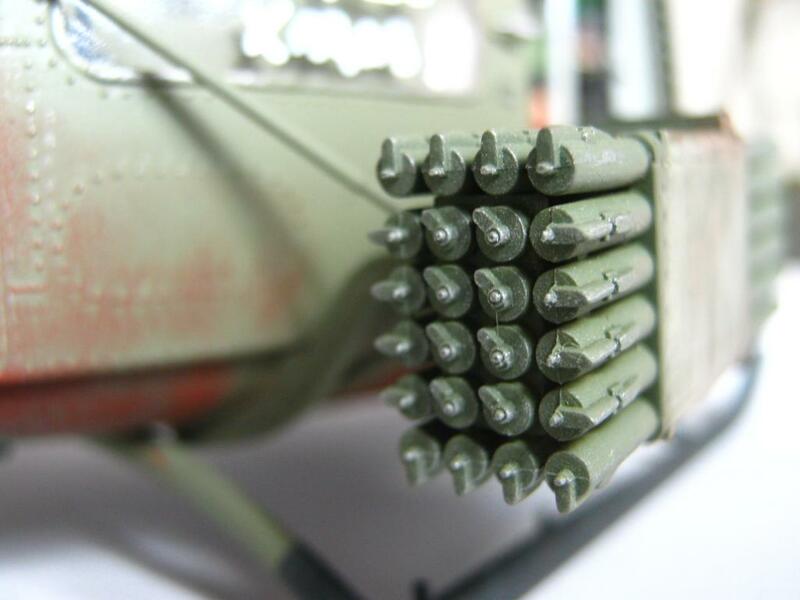 The ball turret for the XM-5 grenade launcher received some bristles from an old brush to simulate the bristles that had to keep dirt and debris from entering the opening between the barrel and the turret. 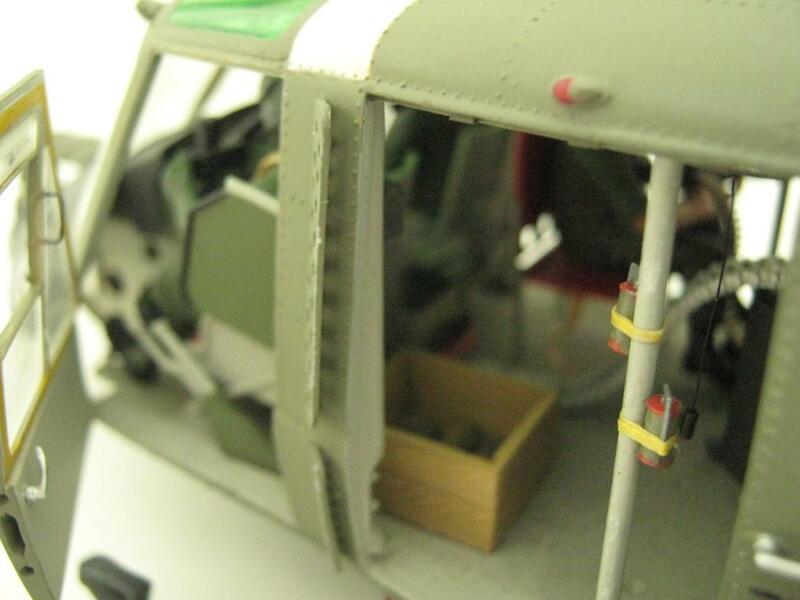 The main rotor stabilising bars were replicated with sewing needles as the kit parts were too thick. 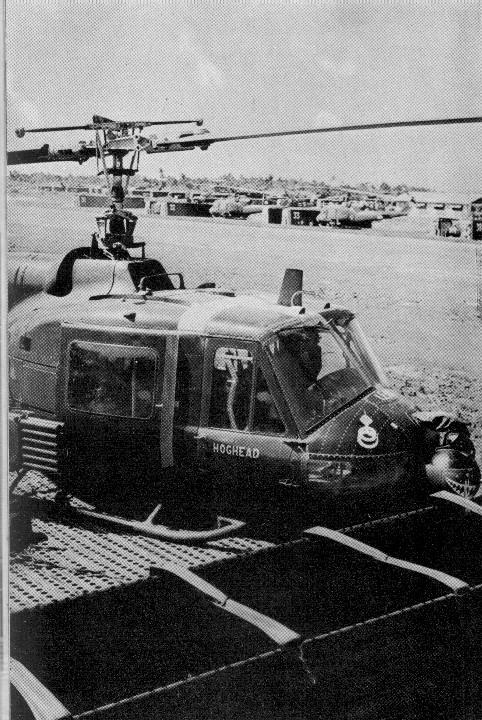 The cabin roof was suitably festooned with the coiled wires from the crew’s communication gear. This was replicated with fine copper wire. 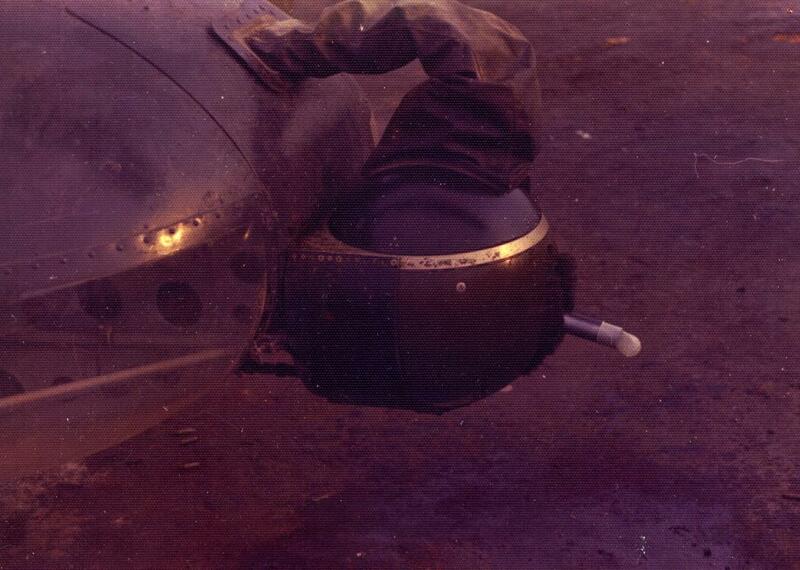 The microphones attached to the crew’s helmets were fashioned out of bits of Evergreen styrene and copper wire. The biggest challenge was hooking the crew’s communication gear up to the roof after the cabin was closed up! 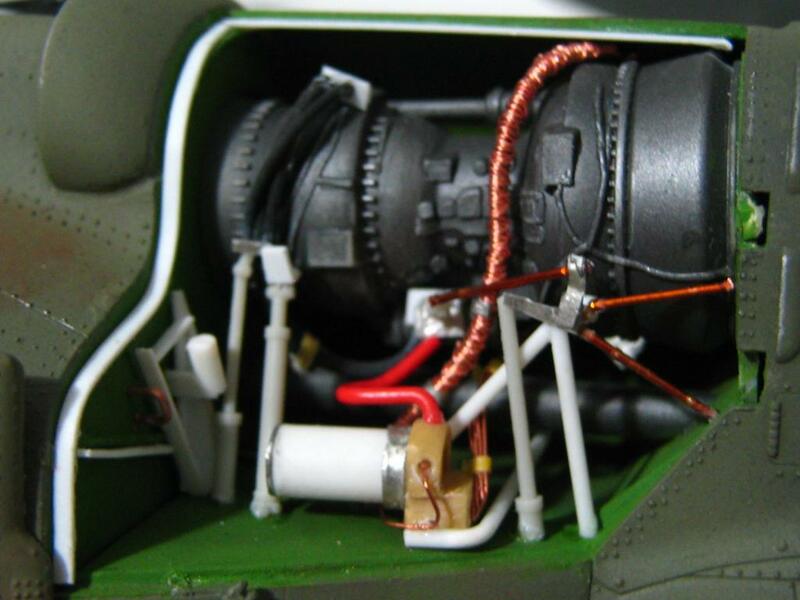 The seat harnesses were made out of newspaper cut to size and fitted with copper wire buckles. 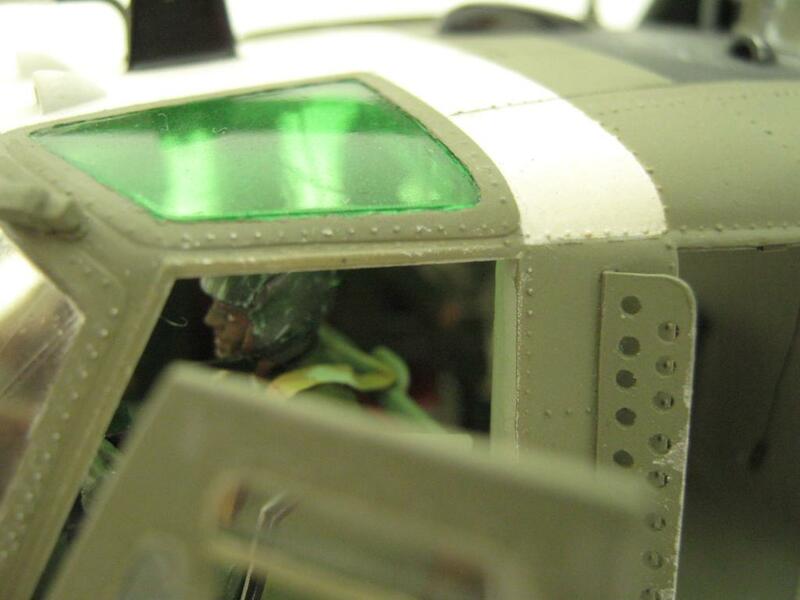 The perforated blast shields in front of the sliding doors were made out of Evergreen styrene. 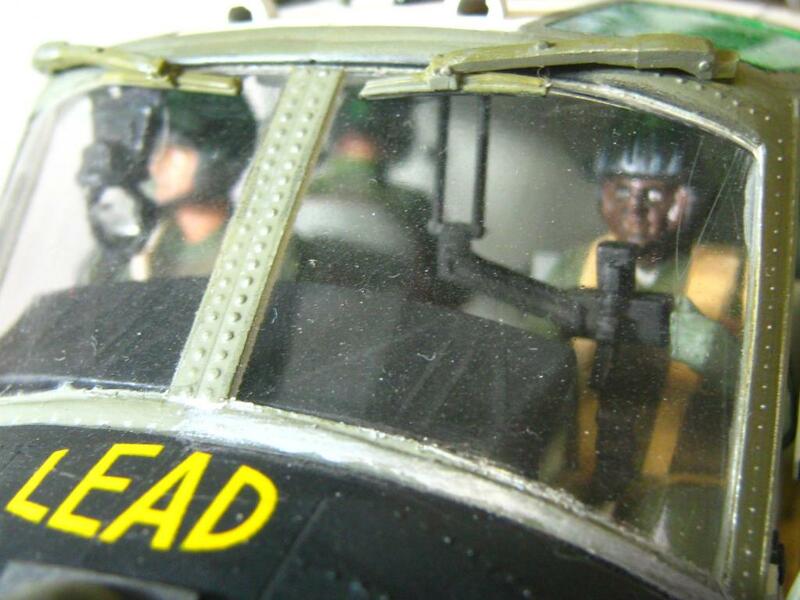 I wanted the crew of ‘Cobra Lead’ to exhibit the gung ho, can do attitude of the 114th AHC. Therefore, they had to have moustaches replicated with an HB pencil. 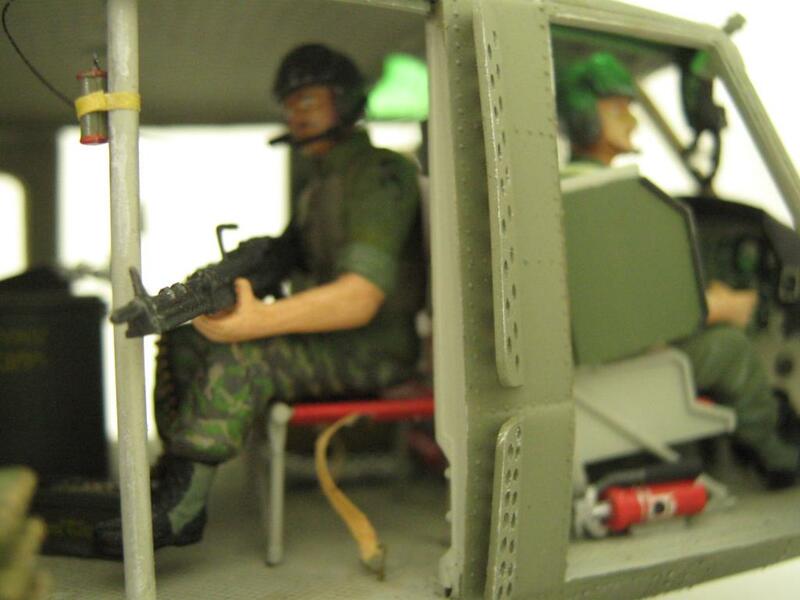 The door gunner did not adhere to regulations and subsequently traded some Tiger Stripe trousers from a Special Forces soldier. The standing figure with his ‘pig’ in hand advertises himself as a ‘hired gun.’ The latter was applied using a fine tipped permanent black marker. 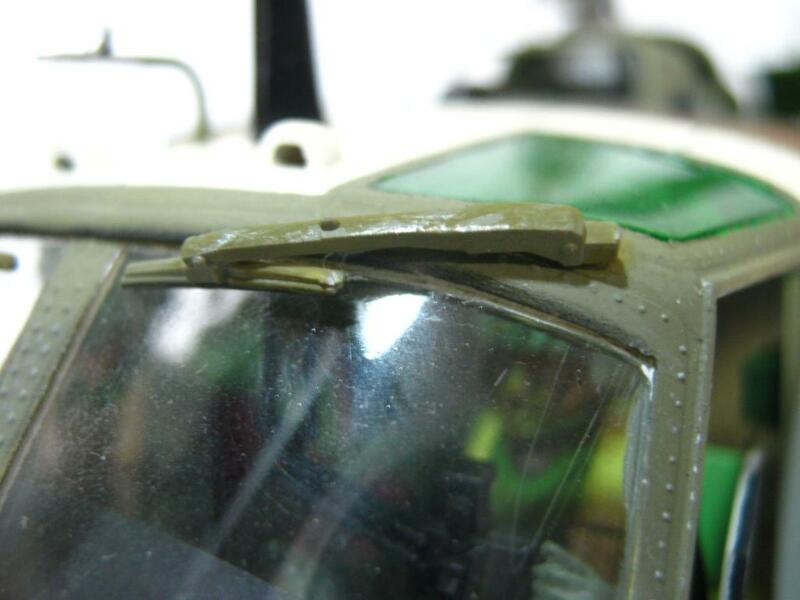 Operating in a dusty and humid environment meant suitable weathering was called for. 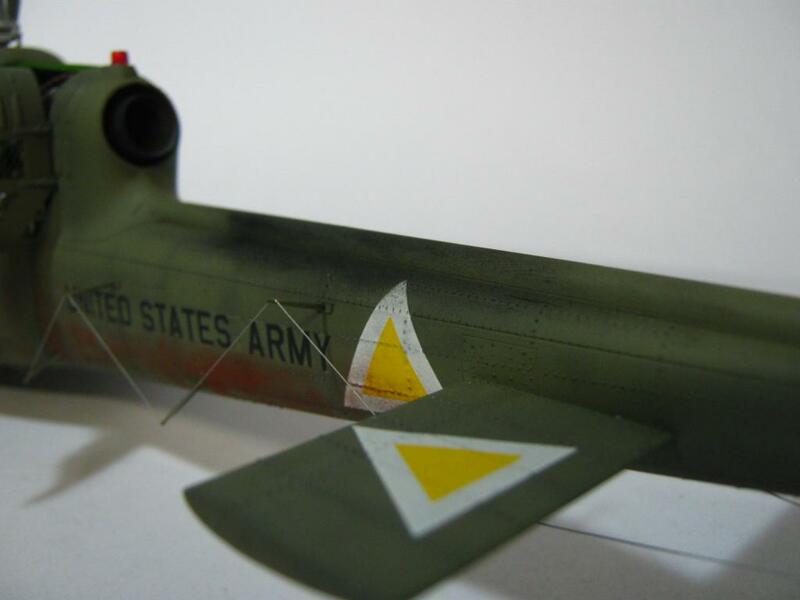 Various shades of olive drab and faded olive drab from Modelmaster was used to replicate a well used appearance. 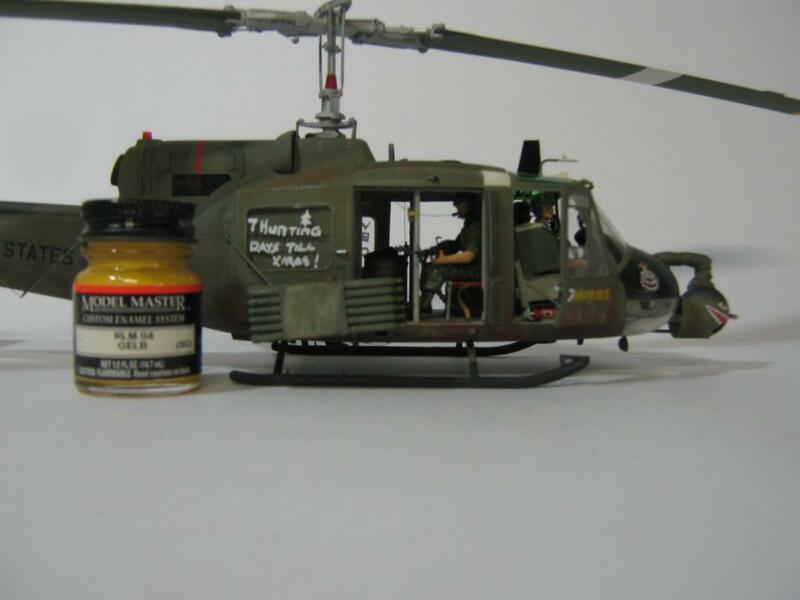 Doc O’ Brien’s weathering powder was used to simulate the red Vietnamese dust and mud. 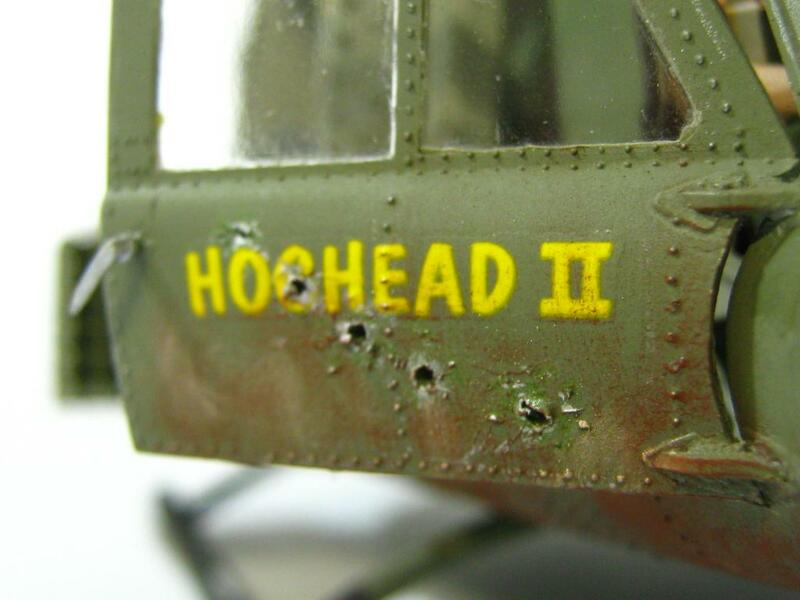 Seeing that the 114th was heavily committed to combat operations, their Huey’s received their fair share of combat damage. 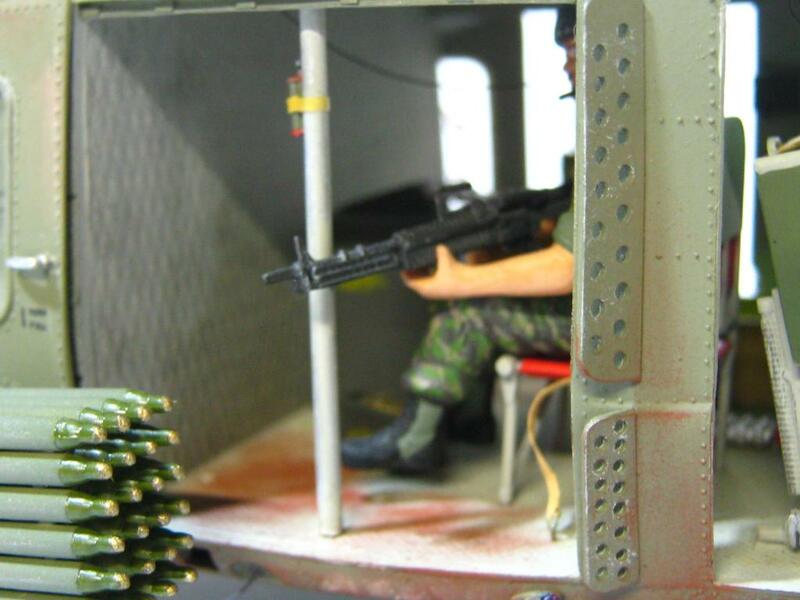 The pilot’s door has received some attention from a VC armed with an AK 47. 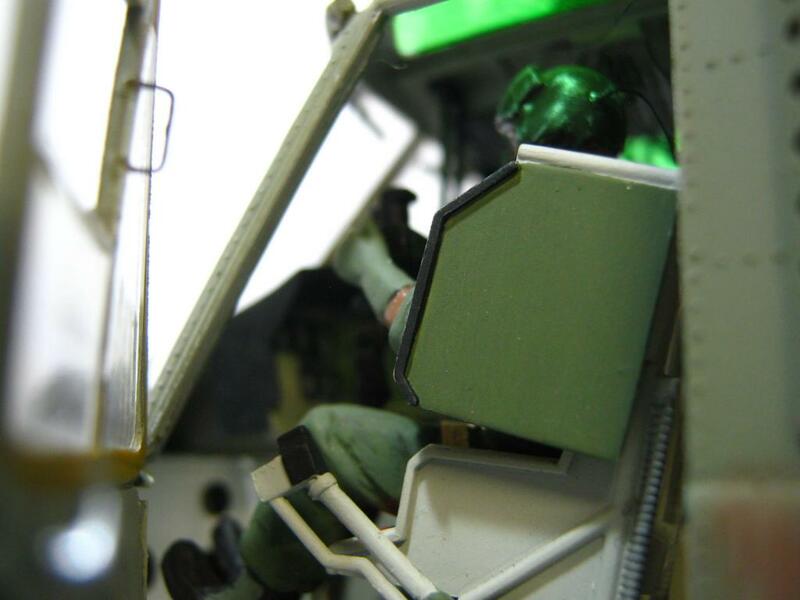 Fortunately the ground crew has added some armour plating to the inside of the pilot and co-pilot’s doors. Needless to say those bullets DID dent the armour on the inside of the door. 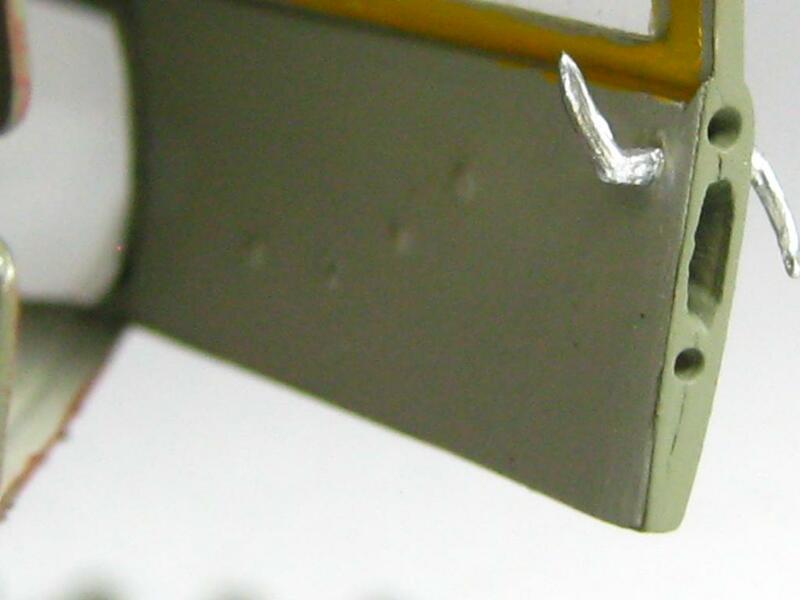 The bullet holes were fashioned with a scalpel and the dents on the armour plating inside of the door was made with a hot needle. 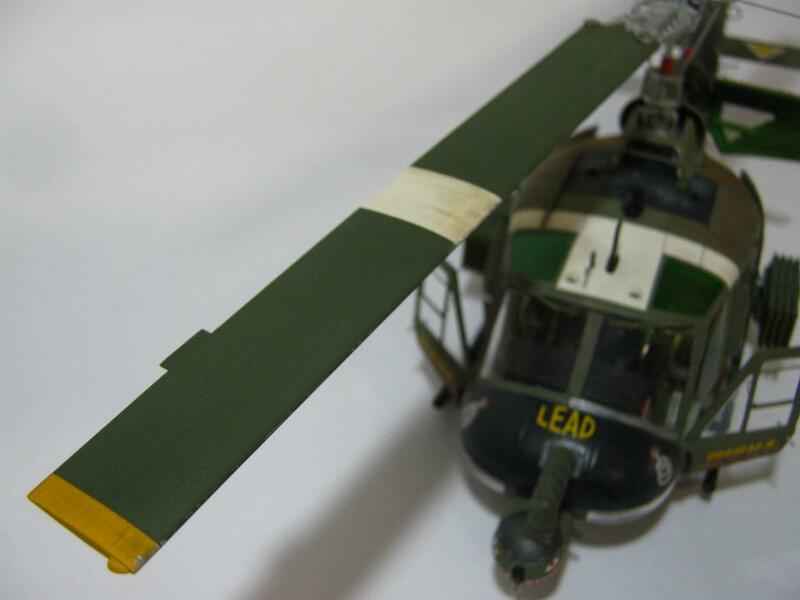 ‘Cobra Lead’ is armed with the impressive XM-3 system which consisted of 48 folding fin rockets in four six-tube banks each side of the helicopter. 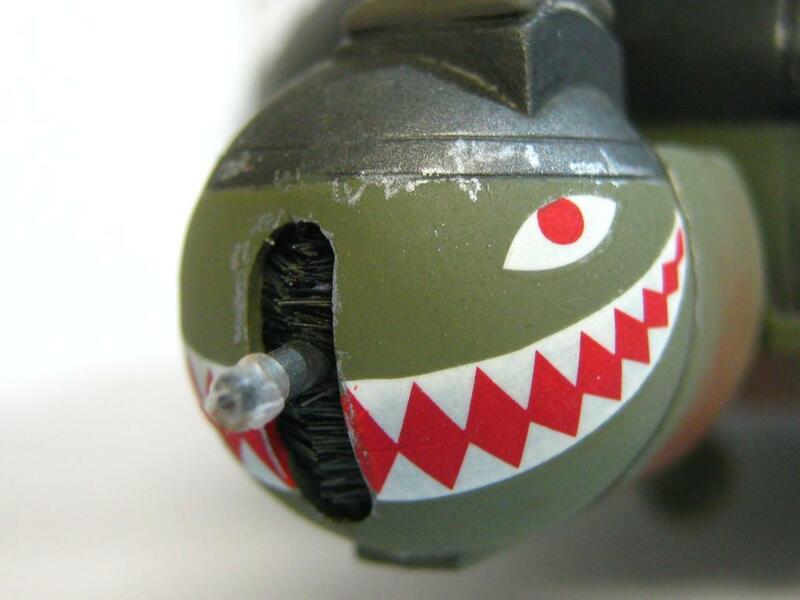 They could be fired by the pilot and co-pilot through a Mk. VIII reticle sight. 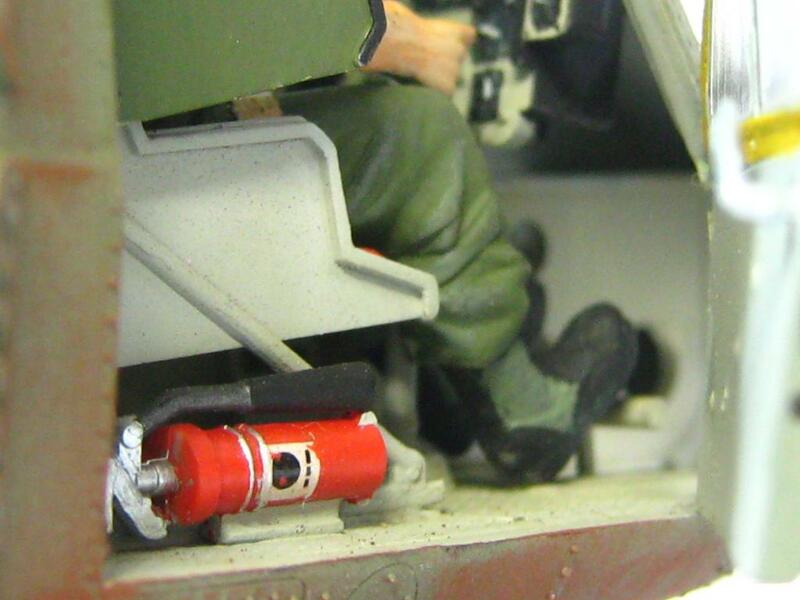 The XM-5 grenade launcher mounted in a ball turret fired 40 mm grenades that were chute-fed from a drum and chute system in the rear cabin. It contained a total of 150 rounds, 75 in the chute and 75 in the drum. 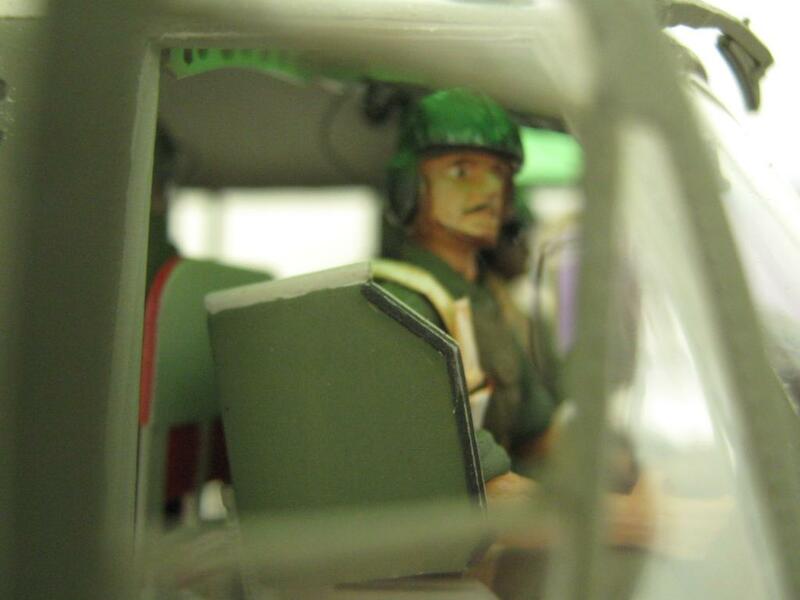 Great build Morne, captures the feel of Vietnam War. Smart detailing as well as some nice pics. 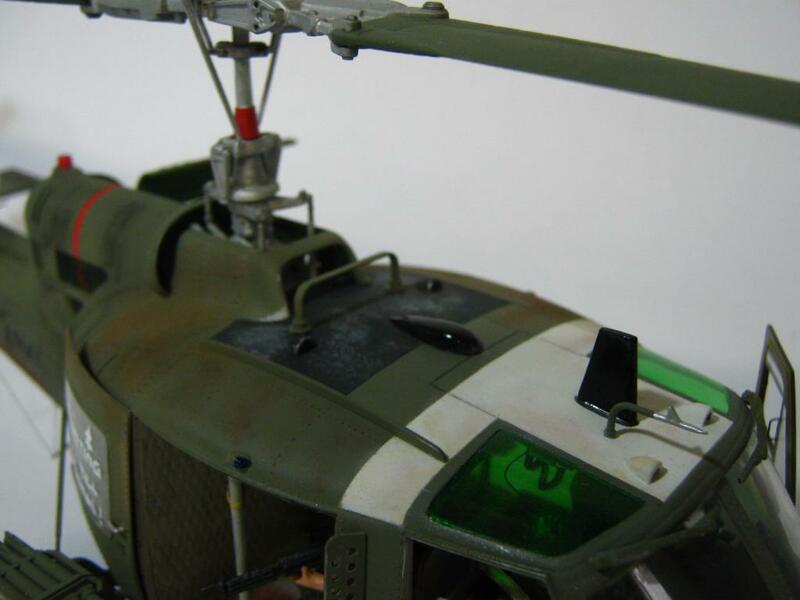 One of the nicest Helicopters i ve ever seen, well done.The amount of added detail is breathtaking ! 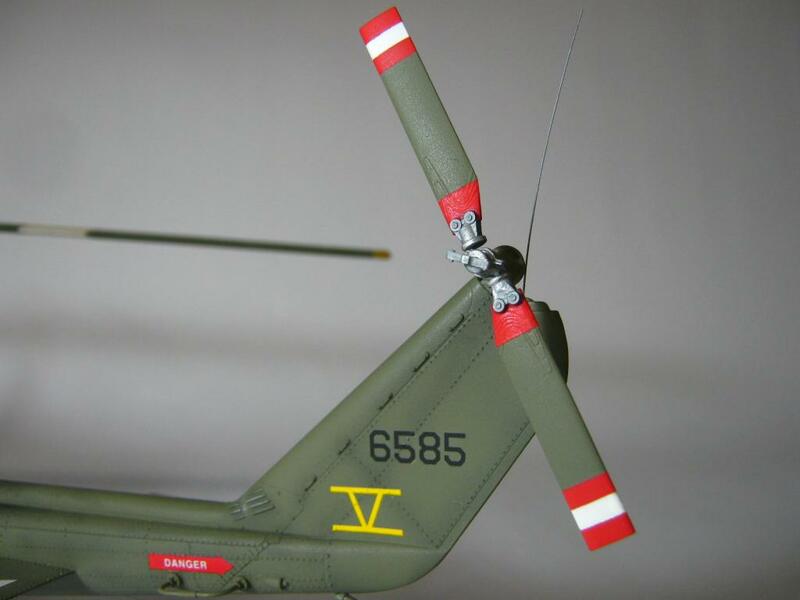 From the condom to the tailrotor, a simply great build, well done my friend.Great footage as well, thanks for the pics of the real thing ! Herzlichen Glückwunsch, Morne ! 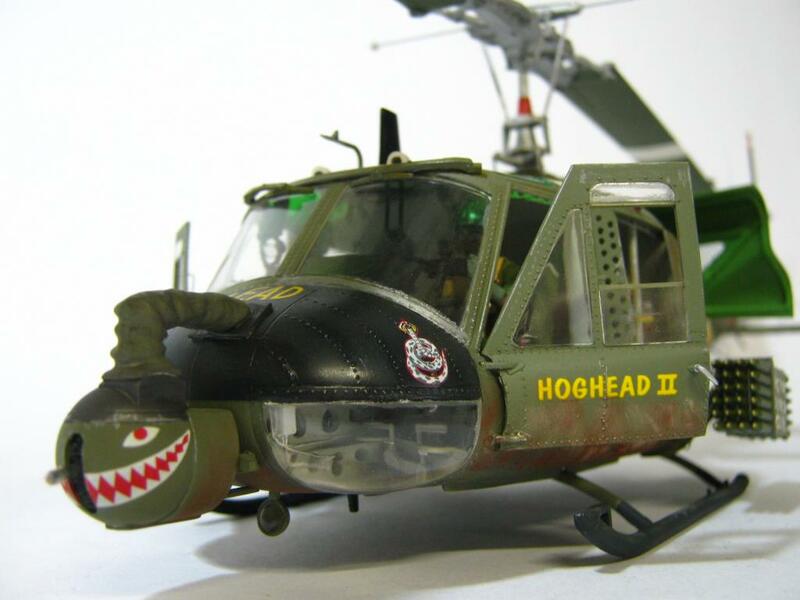 Your Copter is truly amazing. It’s easy to see what ate up that 10 months to build. 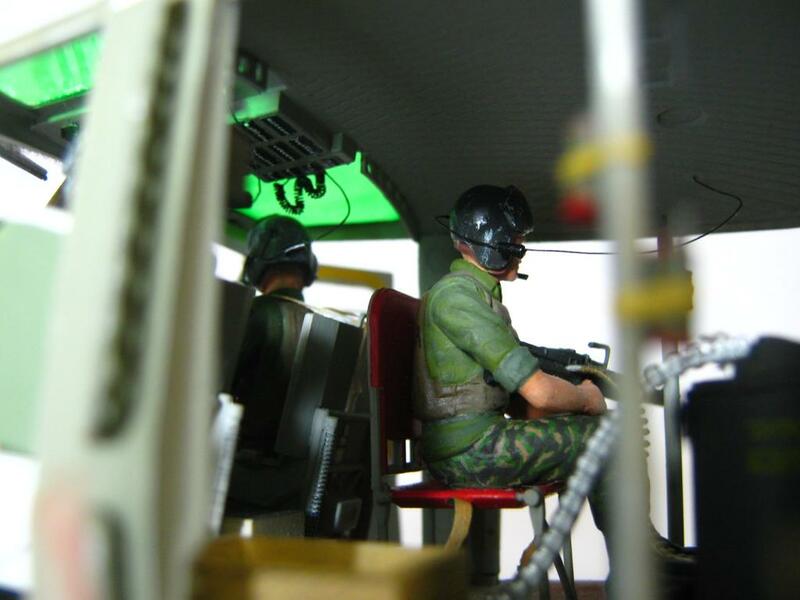 This is a diorama within a model. 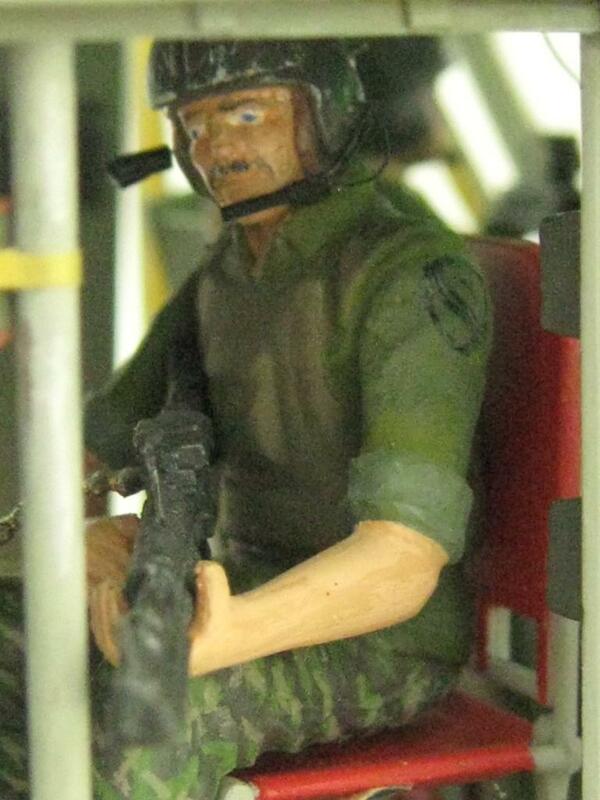 Where did the crew figures come from? All around excellent build Morne. Thanks Al. 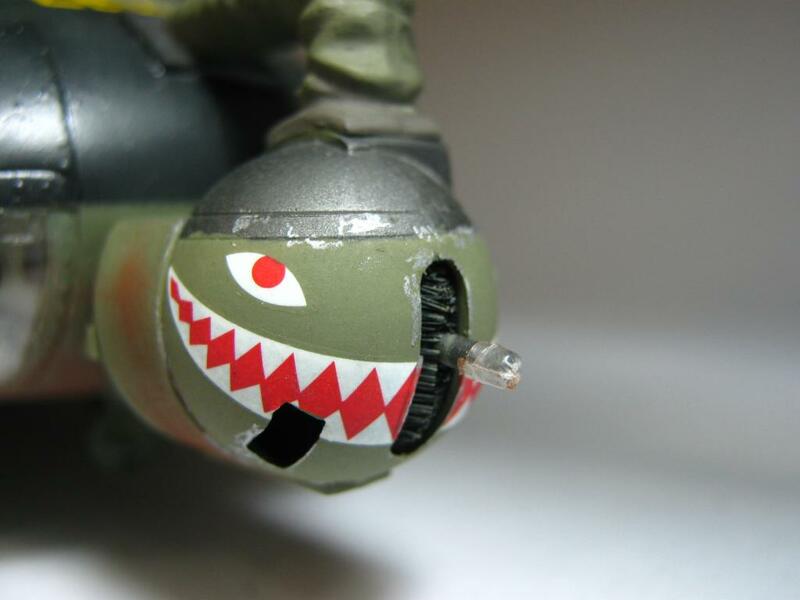 The Hog is destined for a Vignette. The figures came with the kit. 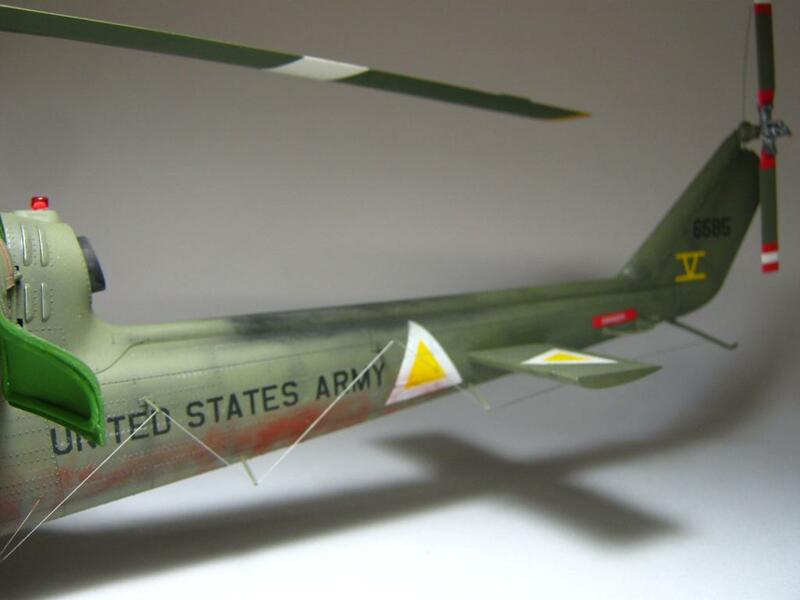 I still have to do a Loach in 1/35 scale. Both of them together in a Vignette one day. The eyes were done with fine tip paint markers. Thanks Nate. The level of added detail on this is amazing mate, I’m inspired! 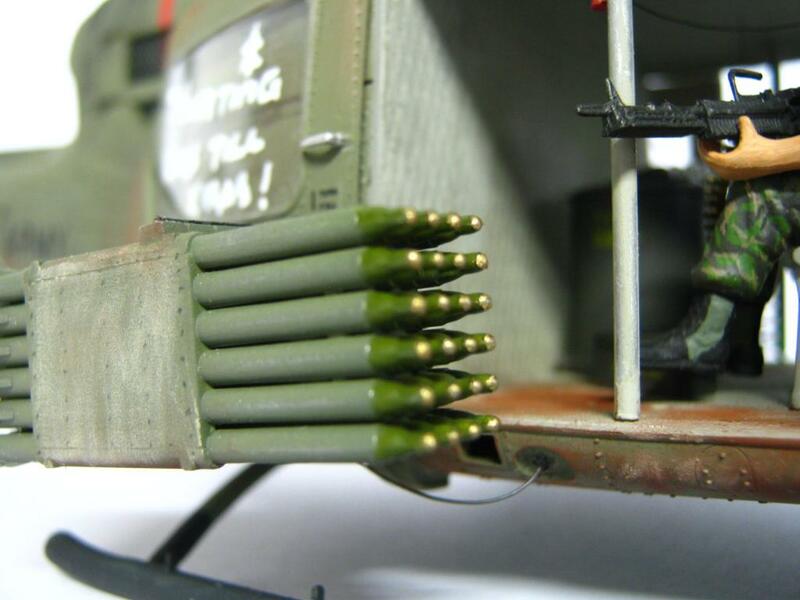 The bullets indentations are like nothing I have ever seen! Everything about this is fantastic!! Thanks Richard for the positive comments. This model is by far the most detailed in my collection. 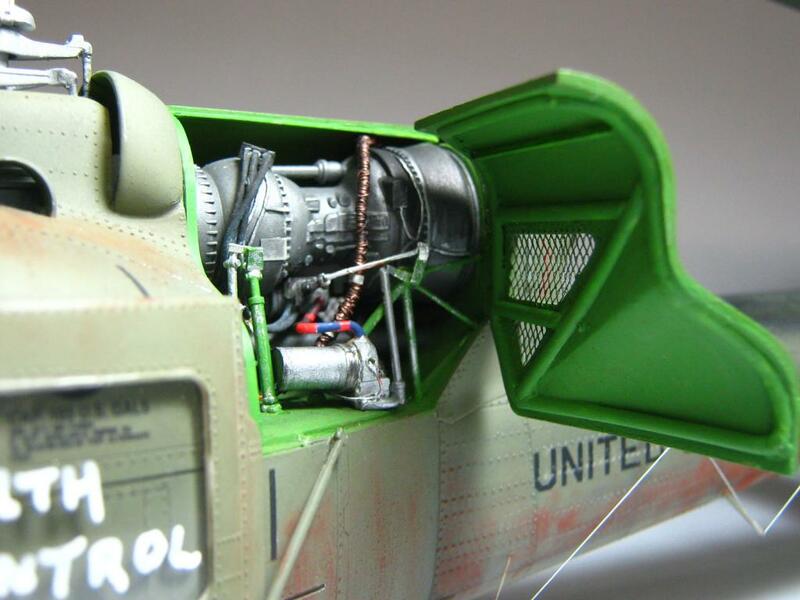 Morne, your skills really came through on this model. I say time well spent. Thanks for taking the time to photograph all the great pics. Wholly Molly! This means good stuff! 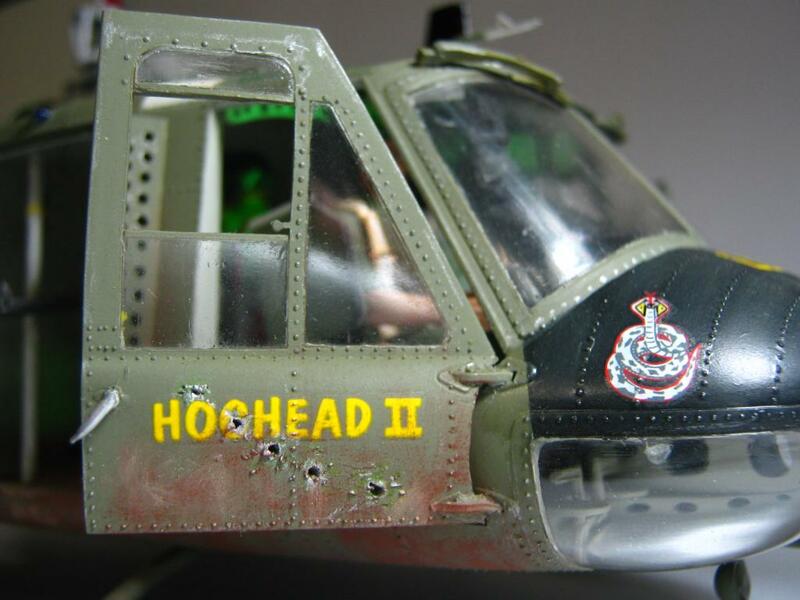 Hey Morne, when I posted my Stuka yesterday, I wrote: “I see a lot of models posted here that pretty well astound me …” This Huey you did is a prime example of what I meant! 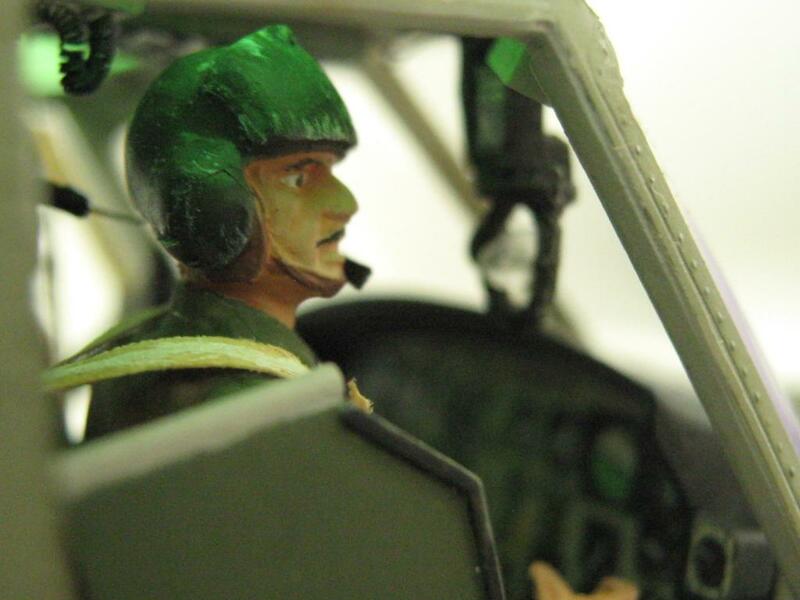 Thanks Ralph for the vote of confidence in my abilities as a modeler! Absolute beauty Morne. 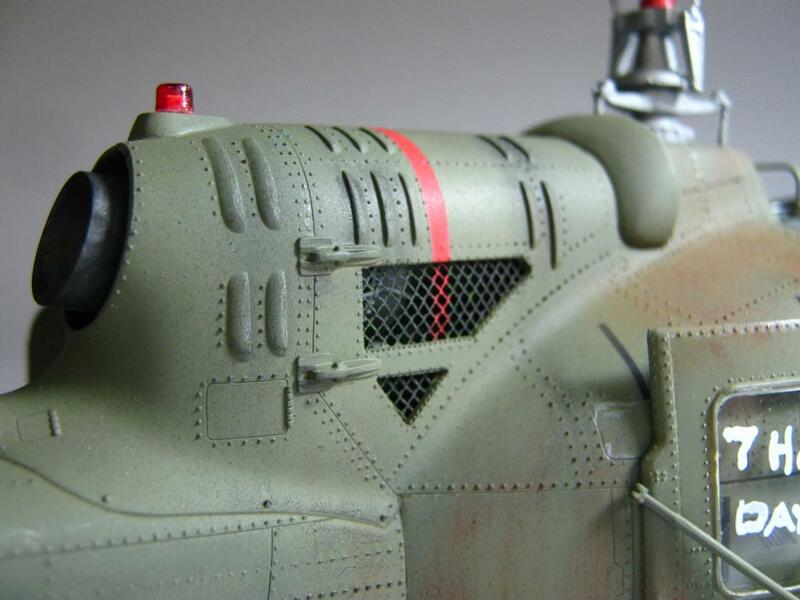 Amazing detail and finish. Well done. Thanks Gregor for the thumbs up on my build. Great looking Hog. 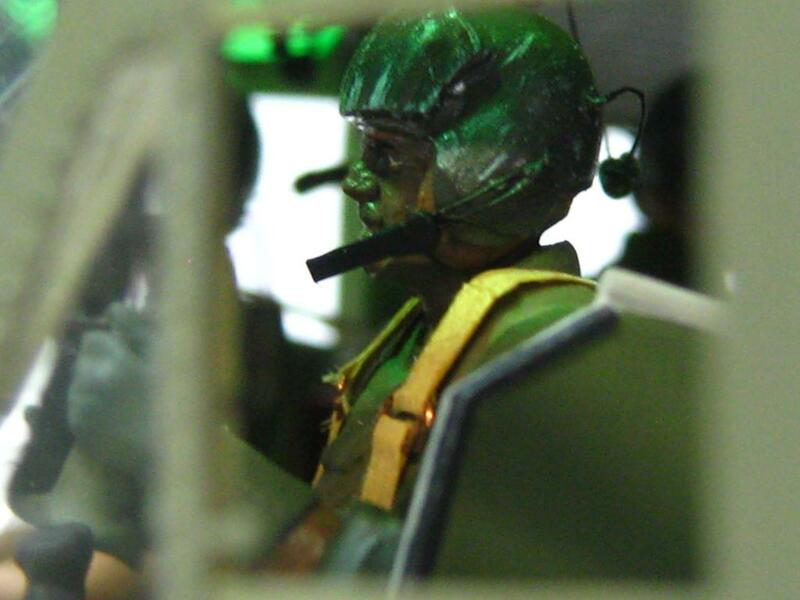 Morne, a fitting tribute to the men that flew, crewed and maintained them. Thanks Rick!! That was the ultimate goal of this build. 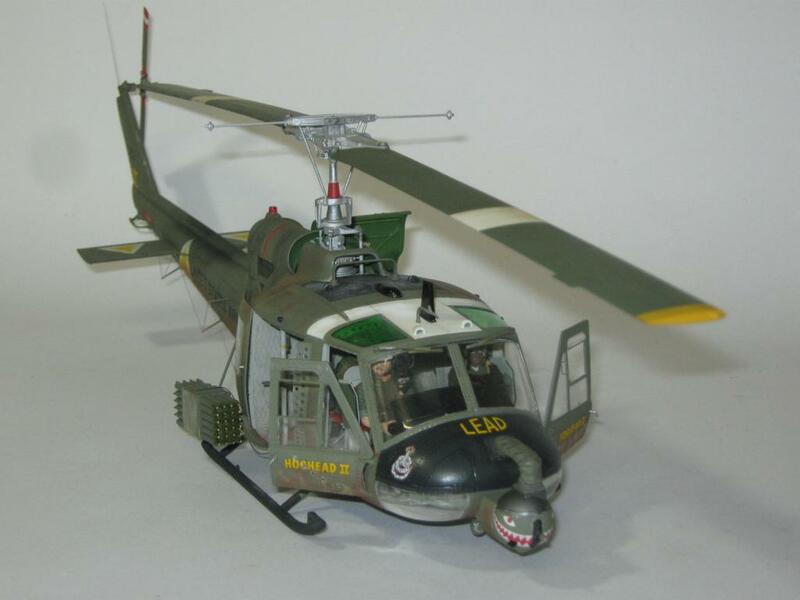 The fact that the US Army lost over 2500 Hueys in Vietnam is proof of how dangerous it was flying choppers in Nam. 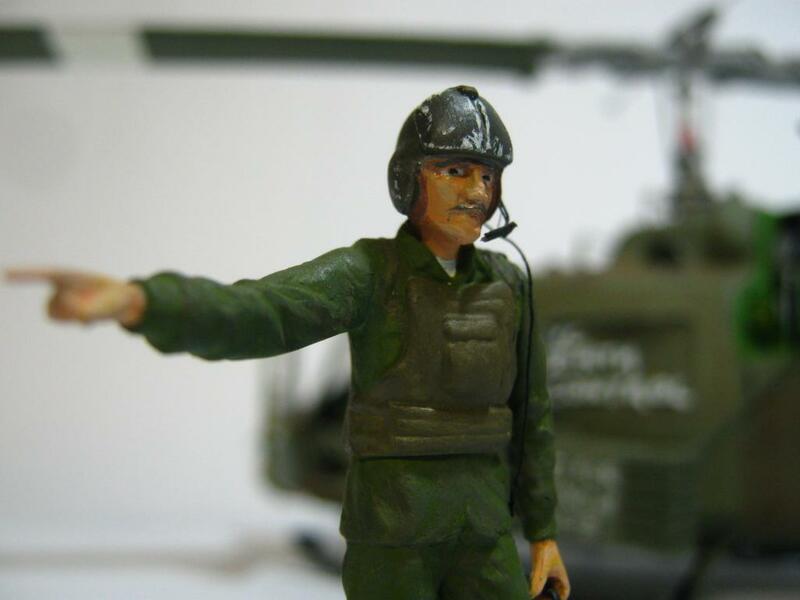 It took a special breed of soldier to fly and fight in a Huey!!! They surely command respect. 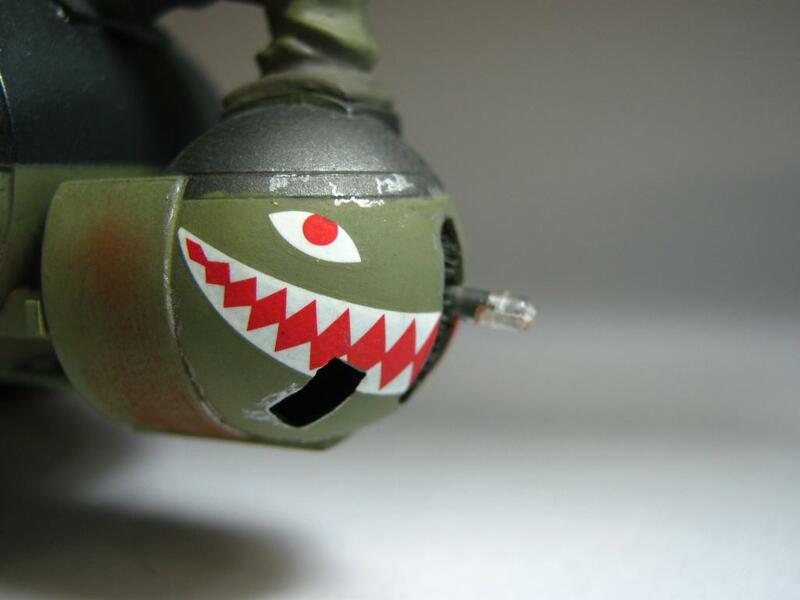 You have captured what the helicopter war was like. 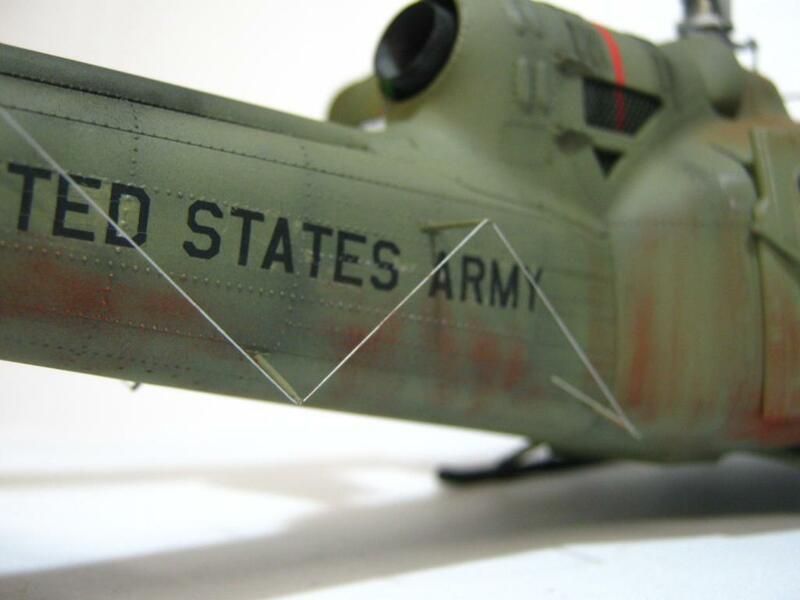 I used to watch “bent” Hueys going past slung under Chinooks quite frequently. They were a familiar sight, flying past the old base camp all day and all night. 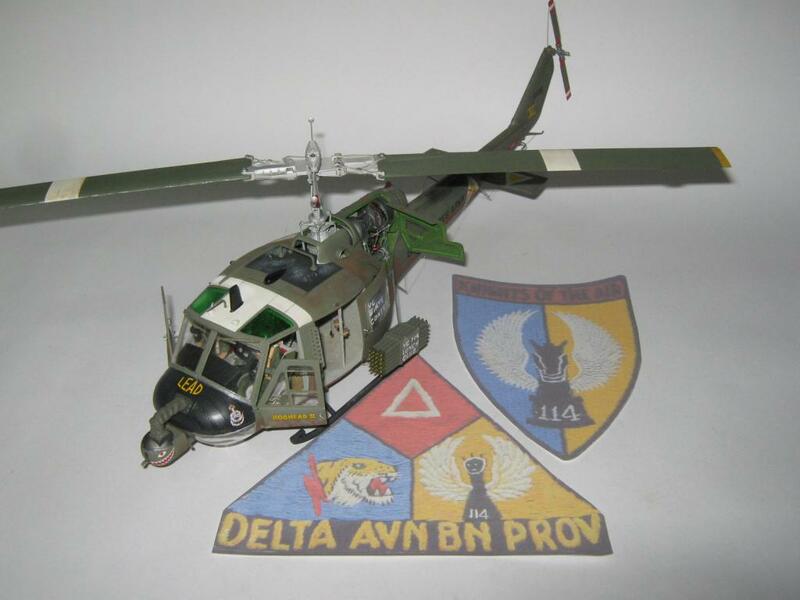 That was during my stay with the 9 th Div., down in the Mekong Delta. I’d know that engine sound anywhere, to this day. 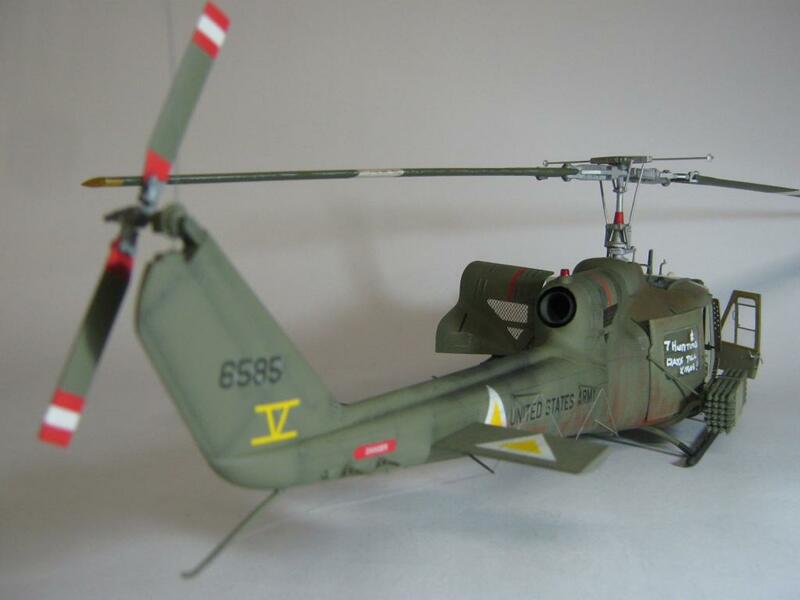 Looking forward to the Loach, which I always wanted to fly in. Rats! Thanks Bernard!! 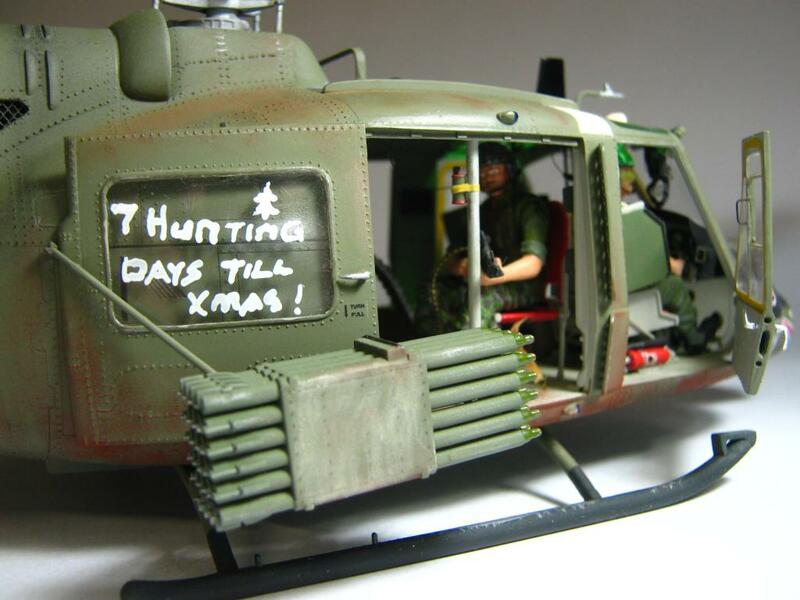 I only have the utmost of respect for those brave crews operating the Hueys. 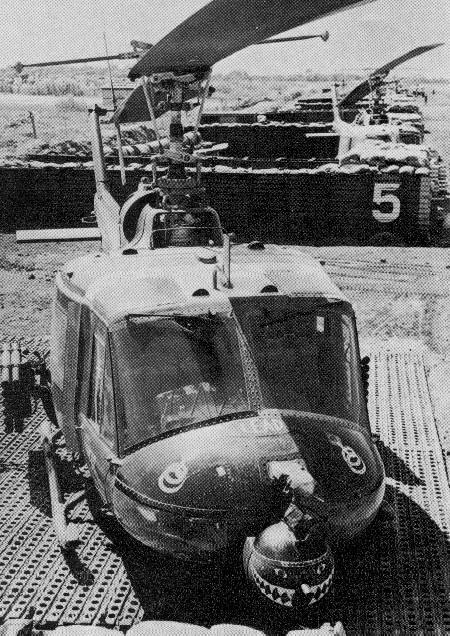 The war down in the Mekong obviously saw the Huey in the gunship roll in support of the brown water Navy. 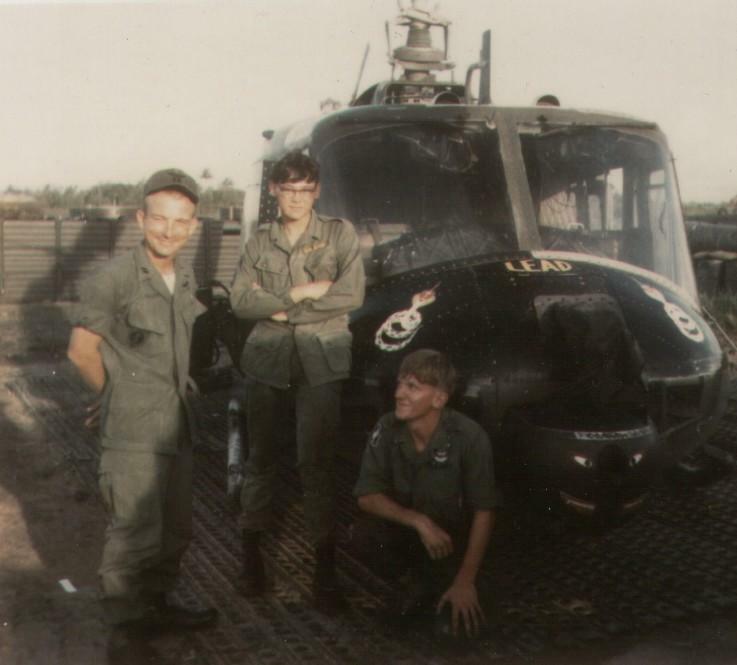 I did my Masters degree in History on the Vietnam war and only has the utmost respect for those that served in Vietnam. Really great modelling here, Morne, I can’t believe anyone could do more with this kit, and, as usual, your write up and photography are first class. Thanks George for the positive comments on my build. This model is by far the most detailed in my collection. Morne, this is great! 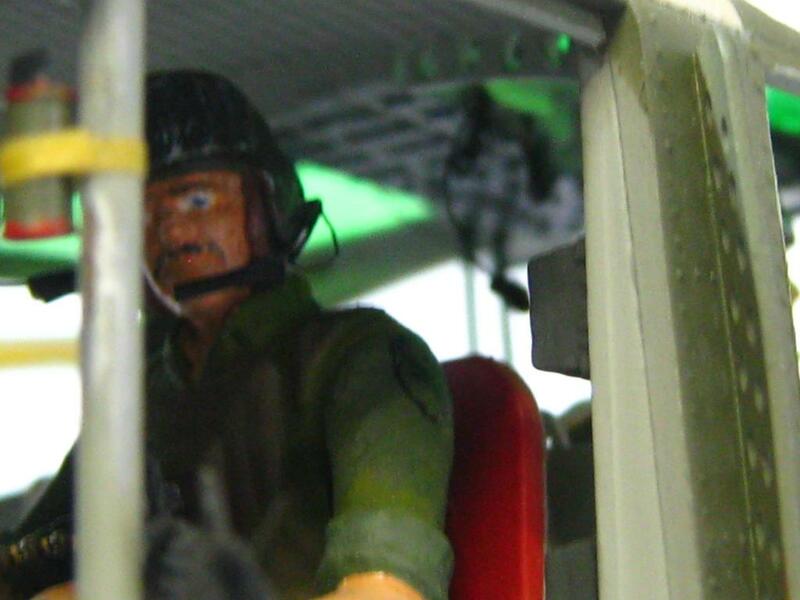 I love all the little details you installed in the cabin and engine compartments, and its cool how you gave the crew personalities. You put a lot of effort into the research and build, and it shows! Great work! Thanks Ramon. 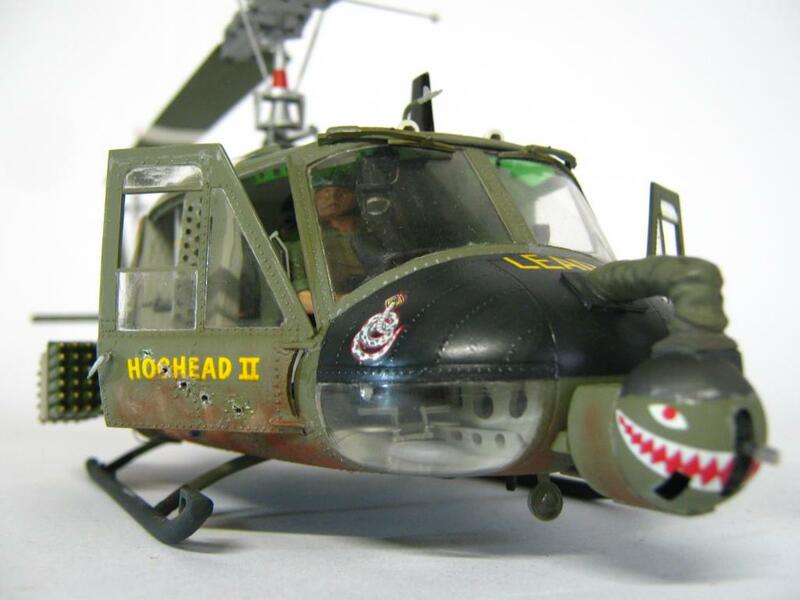 Your Huey was an inspiration to me!! !